but it is now updated using Dreamweaver CC 2015 and TopStyle 5. JT holding his Godson, Peter, who is now twice the age that JT was at the time this photo was taken by Peter's father Don, after the christening in Glenelg, SA. Peter turned 51 in April 2015. Peter took this photo of his parents - Don and Judy - in the later part of 2007. Don and JT met the day that JT joined Elders at 27 Currie Street, Adelaide (see the history below) on 9th February 1959. Don was given the task of being mentor to JT and training him. Some time later JT was invited to dinner by one of his married cousins at their flat and took Don along to make up the number as there were going to be two girls at the dinner from the flat next door. That's when Don met Judy and after the dinner declared to JT that she was the girl he was going to marry. 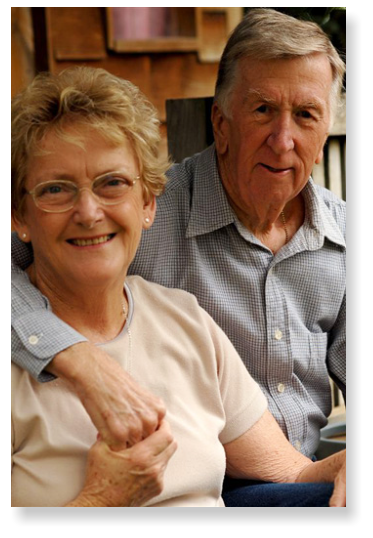 Sadly, Don passed away on Thursday, 14th March 2013 only a couple of months before their 50th wedding anniversary. 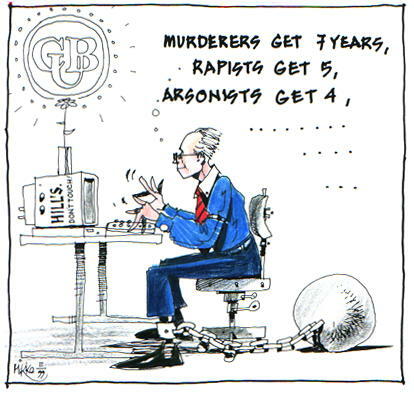 Cartoon by Mikko, in 1999 - commiserating JT serving 40 years at Elders/Fosters which was then essentially managed by CUB. JT retired on 1 November 2002 after almost 44 years with the Company then known as Foster's Group Limited. 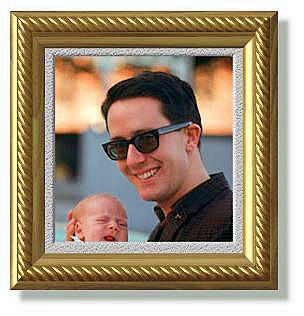 JT (of jthonline.com) started at Elder, Smith & Co., Limited on 9 February 1959 and on his first day at work was introduced to and put in the care of Don (above) as his mentor. In 1962 Elders and Goldsbroughs merged into a new company called Elder Smith Goldsbrough Mort Limited. This company was renamed as Elders IXL Limited in 1982, and renamed as Foster's Brewing Group Limited in 1990, and renamed as Foster's Brewing Group Limited in 2001, and later to Foster's Group Limited. On 24 April 1995 Foster's and its wholly owned subsidiary Carlton and United Breweries Limited (CUB) moved into the current headquarters at Southbank. In 1999, when contemplating JT's 40 years with the Company, a young lady at work said - "You get less than that for murder." JT retired on 1 November 2002.